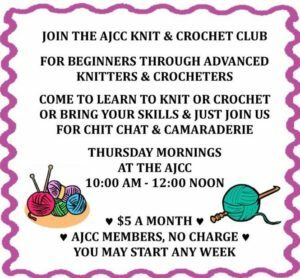 Thursdays | 10 AM - 12 PM | January 8th, 2019 - August 27th, 2019 | Augusta Jewish Community Center Join the AJCC Knit and Crochet Club. For beginners through advanced knitters and crocheters, come and learn to knit or crochet, or bring your skills and just join us for chit chat and camaraderie. Cost: $5 a month / AJCC members no charge. You may start any week! Visit the Facebook Event Page HERE!